This section is aimed at developers who'd like to contribute to the Gazelle Project and develop new simulators. What is a simulator ? A simulator is a stand alone application that mimics one (or more) IHE actors for a given set of IHE profiles. The simulator may implement a web service interface that it used for the communication between Gazelle and the Simulator. The simulator shall also implement the functionality specific to the actors it is simulating. The simulator must to store the messages exchanged with the system under test and it's strongly recommend that it is bound to a validation service to check the conformity of the messages exchanged. How to create a new simulator project ? 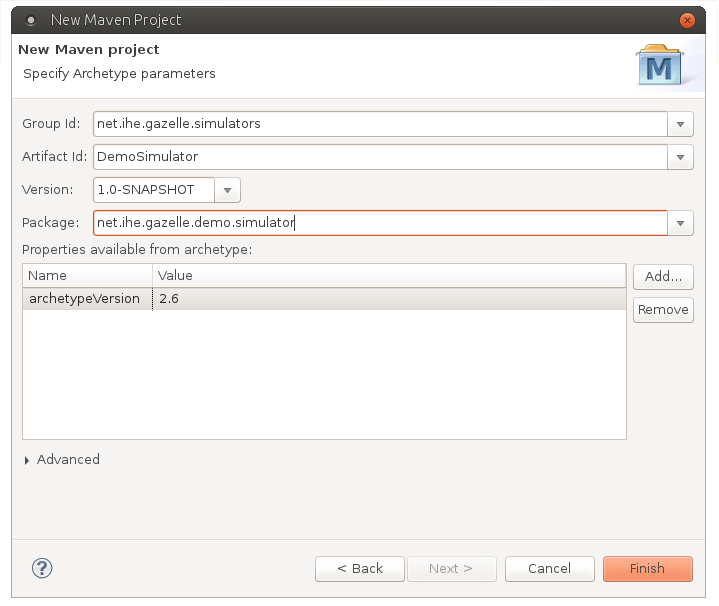 All the simulators of the Gazelle platform are built on the same model using a Maven archetype. This ensures that the layout will remain the same and it avoids wasting time in developing a new template and classes which can be common to several tools. If the simulator you are about to create will implement HL7v2 based transaction, please read the HL7v2 based simulator section of this guide. 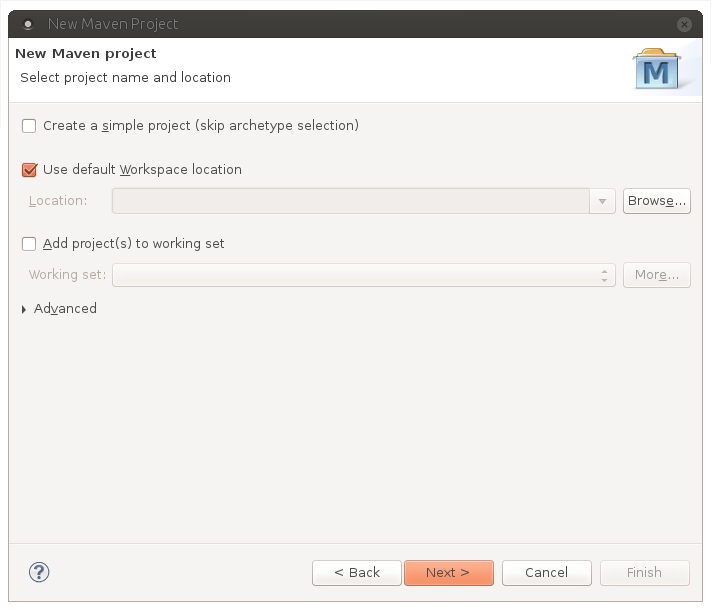 Start Eclipse and create a new Maven Project: File --> New --> Project ... The New project pop-up will appear. 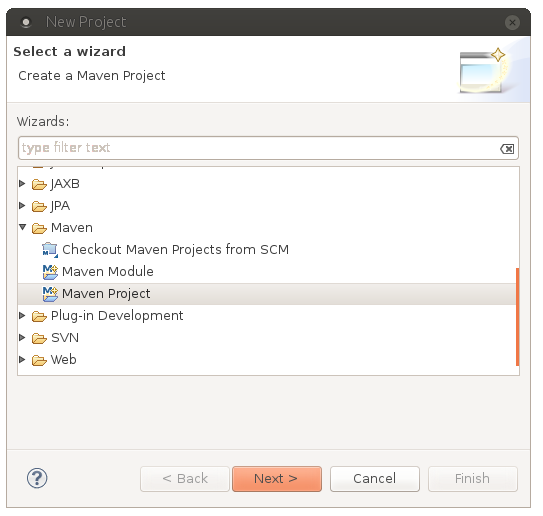 Select the wizard entitled Maven Project (under the Maven folder) and click on the Next > button. Then, you are asked to select an archetype. Select the Nexus Indexer catalog and then Filter with net.ihe.gazelle. You should see an archetype named simulator-archetype. Make sure you have the latest version by checking the Nexus repository of Gazelle. 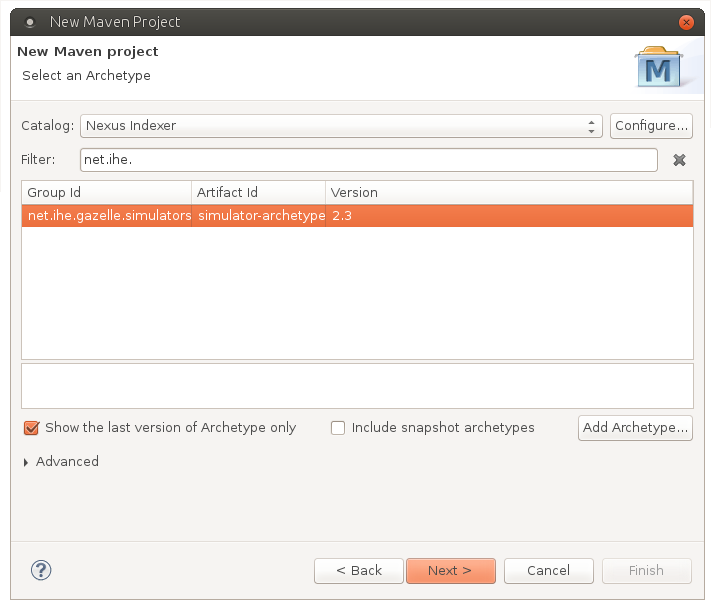 If the latest version does not match the one displayed by Eclipse, you will be able to change it during the next step. Click on the Next > button. Creating the simulator might take a while, once the project is build, it will appear in your list of projects under the Java view. You can now start developing your new tool by editing and completed the pom.xml file available at the root of the project. Finish the process. You might be asked to checkout the project available on the Forge, say YES.